In 2015 ViaWest acquired this 9.025-acre industrial land property in the quickly growing Deer Valley Industrial Submarket in North Phoenix. 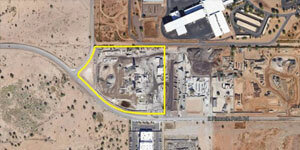 The site was purchased with a 5-year lease to CEMEX, an $11.8 billion market cap, Mexico-based cement and building materials company, who uses the site as an aggregation and distribution hub for North Phoenix. The $8.37 per square foot purchase price equated to a 7.6% cap rate on the purchase. The land is a very attractive future industrial development site, which ended up being included in an Opportunity Zone, as part of the 2017 Tax Cuts and Jobs Act.